How to rake leaves this Autumn without causing strain on your back. Even though leaf raking is good exercise, it is important to remember that without good posture or good body mechanics, raking can put a strain on your lower back and can lead to back pain and discomfort. Raking, just like any exercise, requires proper form. Muscle pain and strain occurs when you put your body in awkward positions and then try to contract or extend muscles in these odd positions. 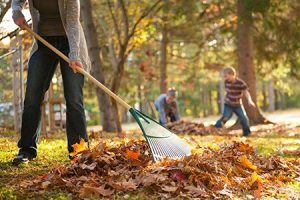 Follow these simple steps to get through Autumn with a healthy back and a beautifully raked garden. Warm Up – Take 5-10 minutes to lightly stretch out and loosen up your muscles. Make sure you focus on the muscles that support the lower back. Don’t forget to stretch out your arms and legs as they are a big part of the raking process. Choose the Right Rake – Before you head out into the garden you should pick a rake that is proportionate to your body size. Using a rake that is too long or too short will cause you to alter your posture and strain your muscles. Also consider that with wider rakes, you can rake more leaves at a time and risk putting more strain on your back. Watch Your Posture – Don’t bend forward from the waist! To maintain proper posture while raking, keep your legs slightly bent, your weight centered, and reach with your arms and not your back. Switch Hands Frequently – Switching arms frequently will prevent muscle strain on one side of your body. Bend With Your Knees – When lifting leaves, keep your back straight and bend with your knees and hips, not your back, when reaching down. The power for your lift comes from your buttocks and legs. Avoid bending and twisting as much as possible. Drink Plenty of Water – While you may not feel like you’re sweating in cooler temps, you must be cautious not let yourself become dehydrated. Muscles need water to function optimally! Wear the Right Gear – Wear supportive shoes with good arch support and skid-resistant soles. Standing on your feet and raking all day can put a lot of strain on your feet and legs. Good foot/arch support can give you more stability to not only prevent your feet from hurting but also decrease some of that strain on your back. Skid-resistant soles can minimize the risk of slipping on wet leaves and falling. A good pair of gloves will provide a good grip without the pain of blisters. Consider a Leaf Blower – Enough said! Take Frequent Breaks – Taking your time and taking breaks will make it less likely for injuries to occur. Pushing yourself to quickly to get the job done can cause fatigue and sloppiness setting you up for injury. Most IMPORTANTLY listen to your body. PAIN is an indication that something is WRONG!